"The seventh trumpet (Rev. 11:15–18) signals the conclusion of this earth’s history. The time has come for God to reveal His power and reign. This rebellious planet, which has been under the dominion of Satan for thousands of years, is about to come back under God’s dominion and rule." Does the book of Revelation tell us anything about the Muslim faith and the religion of Islam? And it's a truth that the Book of Revelation records that its author, the Apostle John, is on record of eating a book. And if so, why? And what about those two mysterious witnesses that are found in the 11th chapter of Revelation, they are also called prophets. They are said to be both killed and resurrected back to life. Are these literal prophets or is God trying to tell us something different? These questions and more will be answered in this edition of the Sabbath School Study Hour. We're so glad that you've decided to join us, and we pray that this will be a blessing as we continue to study that exciting prophetic book of Revelation. Both Granite Bay Seventh-day Adventist Church locally here in Sacramento California and Amazing Facts welcome you to this particular addition of the Sabbath School Study Hour, as we continue to unpack not only the questions that we just proposed but many others as well. But before we open with prayer, I want to take the advantage of inviting you to call in and find yourself getting this particular free book offer. And the book is entitled "Pending Your Case in Court." 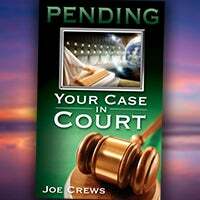 Pending Your Case in Court, written by Joe Crews, you simply have to dial the number that is on the screen here today, which is 1866-788-3966. Again, that is 1866-788-3966. Now if you have a cell phone, you'd like a digital copy of that, you can also find yourself texting a particular quote that you see on the screen, which is "SH050" to 40544. You can find yourself accessing a free digital download copy of that particular gift. Take advantage of that as you continue to study on the same topic that we'll be looking at here in Revelation as well. Well, with that being said, let's ask the Lord to be with us as we pray. Father in heaven, we want to thank You for the opportunity to be able to come together, want to thank You for all those who are both locally here in the Sacramento, Granite Bay Seventh-day Adventist Church, as well as those who are watching online on the different television networks. I want to pray that You will bless each and every one of us that You will guide us with Your spirit as we claim that promise that Your Spirit will guide us into all truth as we come to Your Word with an open heart. Please bless our teacher today as well. In Jesus name, we pray these things. Amen. I'd like to introduce our teacher today, which is Pastor John Ross, one of our local pastors. As he teaches us, we want to pray and wish him all of God's blessings. God bless you, Pastor Ross. Thank you, Pastor Shawn. Good morning, everyone. And welcome to Sabbath School Study Hour. Our study through the entire quarter has been on the Book of Revelation. Today, we're going to be delving in, well, probably one of the most interesting and complicated and may even had difficult parts of this prophetic book. We're going to be talking about the seven trumpets. Now if you're following along in your lesson quarterly, we're on lesson number seven. And it's simply entitled "The Seven Trumpets." If you have your lesson quarterly, it's page 52. We have a memory verse that we find right at the top of our lesson. It comes from Revelation chapter 10. And I'd like to read that to you. It's Revelation 10:7, a very important verse it says, "But in the days of the sounding of the seventh angel, when is about to sound, the mystery of God will be finished, as He declared unto His servants the prophets." Couple of things to note in this verse, it's talking about the sounding of the seventh trumpet. It says when the seventh trumpet is about to sound, a mystery will be revealed, a mystery that was given to the prophets. Now the question we want to ask this morning is, well, what is that mystery? Who was the prophet that had that mystery? And what does that have to do with the sounding of the seventh trumpet? Some very important information that we want to study today on Sabbath afternoon in our lesson quarterly. We have the third paragraph on the introduction section. I'd like to read that because that sets the stage for our study today. The last paragraph says the vision of the seven trumpets shows that throughout history God already has intervened on behalf of His oppressed people and has judged those who harm them. The purpose of the seven trumpets is to show God's people that heaven is not indifferent to their sufferings. Now in the Book of Revelation, we have a series of sevens. You can see if you can help me out with this. We begin by reading about Revelation chapter 2, 3, we have the seven what? Seven churches. And then if you read a little further, in chapter 6, we have something called the seven seals. Very good. And then chapter 8 and 9, we read about the seven trumpets. The seventh trumpet, we don't read about until Revelation chapter 11, beginning verse 15. We'll talk about the significance there. But the seven churches, the seven seals and the seven trumpets, cover roughly the same time period. It's the Christian era, beginning with the first century and then going all the way through to the time in which we are now living. So when you look at the seven churches, the church of Ephesus was the church of the first century, the church that describes the Christian church at the time that John wrote the Book of Revelation. You look at the seventh church in Revelation chapter 3, it's called the church of Laodicea, it's spiritually lukewarm. It really describes the condition of the church even today. When you look at the seven seals, you see something similar. The first seal represents the gospel going forth victorious and powerful, and then if you look at the sixth seal, it brings you right up to the second coming of Christ. And it's not until you get to Revelation 8:1, we have the opening of the seventh seal, and that's what we're going to start with today. So if you have your Bibles, turn to Revelation chapter 8, and we're going to start reading here, Revelation chapter 8, we're going to finish the seals and then we're going to move on into the trumpets. Revelation chapter 8 and we're going to begin in verse 1, Revelation chapter 8, beginning then in verse 1. It says, "When He had opened up the seventh seal, there was silence in heaven for about a space of half an hour." So the seventh seal is open. What happens just before the seventh seal opens? You have Revelation chapter 7 which talks about the 144,000, those that the seal of God in their foreheads and you remember that chapter 7 of Revelation, as we discussed last week, is really an answer to the question that's asked at the end of chapter 6. Chapter 6 brings you up to the opening of the sixth seal, brings you right up to the second coming of Jesus, and a question is asked in Revelation chapter 6. If you look in verse 17, it says, Revelation 6:17, "For the great day of His wrath has come and who shall be able to stand." So the sixth seal brings you up to the second coming of Jesus, a question is asked who's going to be able to stand when Jesus comes again. That question is answered in Revelation chapter 7. It describes a group of people that have the seal of God in their foreheads. Yes, they are the ones who will stand when Jesus comes. Then in chapter 8, we go back to finish up with the seals. And when the seventh seal is open, verse 1, it says "There's silence in heaven about the space of a half an hour." Why is there silence in heaven? Well, that's because most of the inhabitants of heaven have left. Where have they gone? Well, if you look at the sixth seal, it talks about the second coming of Jesus. I mean, Jesus comes the second time, who comes with Jesus? All the angels. So Jesus and all the angels have left heaven, they've come to the earth. It's the second coming, Jesus come to gather the righteous, thus there is silence in heaven about the space of a half an hour. Now time prophecies in the Book of Revelation are rather significant we actually have a specific time period given here about the space of a half an hour. And now we need to do a little math, it's not too complicated, but let me walk you through it. The Bible tells us that one prophetic day is equal to one literal year. You get the principle? One prophetic day is equal to one literal year. A Hebrew year had 360 days. So keep that number in mind. And a day has 24 hours. It had 24 hours back at the time of the Old Testament, it has 24 hours today. So if we take a year, 360 days, and we divide it by 24 because there's silence in heaven about the space of a half an hour, so we begin by dividing it by 24, we end up with 15 days. That would be roughly the equivalent to one hour, about 15 days. How long is there silence in heaven? It says about the space of a half an hour. So we take the 15 days and we cut it in half and we come up roughly with about seven days. So the Bible tells us there is silence in heaven for about seven days when Jesus comes. So does that means it takes seven days to go from heaven to earth and then back to heaven. Well, of course, Jesus and the angels, they could be here instantaneously, but it does give us the idea that the journey back to heaven seems to take about seven days. There are some things that Jesus wants to reveal to the redeemed on their way back to heaven. I'm not quite sure what it is that God wants to reveal or Christ wants to reveal to us as we journey back to heaven. But I'm sure as we travel those seven days back to the golden city, our anticipation is growing because there is somebody waiting for us in heaven. Who's waiting for us in heaven? God the Father. And Jesus is about to introduce us face to face to his father, that journey from Earth to heaven about the period of seven days. So that's the opening of the seventh seal rather interesting. Okay, now gears shift just a little and we get into the trumpets. If you look in verse 2 all the way through to verse 6 sets the stage or is the introduction to the sounding of the seven trumpets. Trumpets, back in Bible times, were often used as announcements for war, or judgment, or calling people's attention to something, perhaps a general assembly, a trumpet would sound. You remember when judgment came upon Jericho, back in the Old Testament, there were angels that marched in front of the ark and they sounded on silver trumpets, they sounded actually... they were the ram's horn trumpets. They sounded trumpets. They were a sign of judgment that was about to come. So these trumpets represent certain judgments that come upon the earth. Now we have the introduction to that. The point that I just want you to note, we don't have time to read all the verses in chapter 8 and 9, I wish we did, but we'd never get through chapter 10 and 11 if we did so. So I'm just going to give you the high points. What I want you to notice then is the imagery of where this takes place. Look at verse 2 and 3, it says, "And I saw seven angels, who stood before God, and to them were given seven trumpets. Then another angel, having a golden censer, came and stood by the altar, and he was given much incense that he should offer it with the prayers of all the saints upon the golden altar which is before the throne." Now the earthly sanctuary is a shadow of the heavenly sanctuary, and the earthly sanctuary, there were three articles of furniture in the first compartment known as the holy place, the table of showbread, the seven-branch candlestick, and our altar of incense. Now what John is seeing here in Revelation is a description of the heavenly sanctuary. Where about in the heavenly sanctuary does John see these things taking place? In the first compartment, the holy, or in the most holy place, which is the second compartment, where do you find the altar of incense? In the first compartment or the second? You find it in the first compartment of the sanctuary. So these judgments were to take place on the earth, the sounding of the trumpets, the judgments take place on the earth. They had to take place before probation closes, before there is a transition from the first compartment to the second compartment, that's important to note. Incidentally, when the seventh trumpet sounds, that we're going to read about in Revelation chapter 11, suddenly we see the Ark of the Covenant in the temple of God in heaven. Where is the Ark of the Covenant? In the most holy place. So between the sounding of the sixth trumpet and the sounding of the seventh trumpet, there is a shift of focus in the heavenly sanctuary from the first compartment into the second compartment. All right, put that in the back of your mind, we'll come back to it when we get to Revelation chapter 11, but that's an important part to note. Now what does this altar of incense and the smoke that ascends from the altar represent? Well, the Bible goes on to tell us, verse 4 says, "The smoke of the incense, with the prayers of the saints, ascended before God." So the altar of incense and the smoke represents the prayers of the saints. But then in verse 5 and 6, there is a change, an angel takes some of the fire from the altar, he puts it in the censer, but he does not add any incense. He takes it and he throws it down to the earth. So Bible scholars are recognizing this that the next sounding of the trumpets are judgments that come upon the wicked. There is no incense mingled with the fire. It's just fire. Fire is often a symbol of judgment that God brings upon the wicked. So with that as the background, let's take a look at the first of the trumpets. You find this in verse 7. Revelation 8:7, it's just one verse. It says, " The first angel sounded, and hail and fire followed, mingled with blood, and it was thrown to the earth. And a third of the trees were burnt up and all the green grass was burnt up." Now Getting into the trumpets, probably the most descriptive and detailed prophetic imagery that you'll find anywhere in the book Revelation. When we get to chapter 9, describes into the fifth and the sixth trumpet, talks about these locusts, and it says that they breathe fire and their tails are like the tails of scorpions, and they wear crowns, and their hair is like the hair of woman, all kinds of very detailed descriptions it's given. So it's a rather deep study, the seven trumpets. But what does this first trumpet represent? This fire been thrown into the earth. It says it burns up the trees and the grass. Well, a number of Bible scholars recognize this as an act or at least prophecy concerning the judgment and act of judgment that came upon Israel, specifically Jerusalem, for the role that they played in crucifying Jesus. Notice it talks about the trees being burnt up. You can read about this, in Luke chapter 23, when Jesus was taken to Calvary and he was being led by the Romans and they were beating Jesus and pushing Jesus and He had been carrying the cross and He had stumbled onto the weight of the cross. And Simon had taken the cross and was carrying it for Jesus, and the procession made its way through Jerusalem towards Calvary. The Bible says in Luke chapter 23 there that there were some women, people of Jerusalem, that wept when they saw what the Romans were doing to Jesus. And Jesus stopped and He said to these women that were weeping, "Daughters of Jerusalem, don't weep for Me, but weep for yourselves," and then He goes on to say, "If they, "meaning the Romans, "do this when the tree is green, what will they do when the tree is dry?" Now that's a cryptic statement made by Jesus. He says don't weep for Me, but He says weep for you and your children for if they, the Romans are doing this to Me and to the Jews during the green tree, what will happen during the dry? While the green tree there represents the probationary time that God had given to the nation of Israel. After the resurrection of Jesus, remember the gospel primarily went to the Jews in Jerusalem for the next 3.5 years, until the stoning of Stephen in 34 AD, which was the fulfillment of the 490 year prophecy in Daniel chapter 9, that probationary time period that God had given to the Jewish leadership, the Jewish nation, in particular, to receive the gospel that came to an end in 34 AD at the stoning of Stephen. God then withdrew His protection from the city, from Jerusalem, and what did the Romans do in the dry tree after that probationary time period when God's protection was withdrawn? Well, we just need to go back and look at history. In 70 AD, the Romans came, surrounded Jerusalem, and there was a terrible slaughter. As one historian put it, he said there was so much death and destruction at the temple that blood flowed down the temple stairs like water. And the inhabitants in Jerusalem were killed. Now, of course, the Christians who understood these words of Jesus, especially the prophecies given in Matthew 24, they saw the signs that Christ had given, and they fled from Jerusalem before its final destruction. But hearing the first trumpet, many Bible scholars see this as a fulfillment of judgment that came upon Jerusalem there in 70 AD. Okay, now looking at the second trumpet. This is verse 8. It says, "Then the second angel sounded and something like a great mountain burning the fire was thrown into the sea, and the third of the sea became as blood." I want you to notice the parallel, at least the imagery that we have of the trumpet as related to the plagues. It talks about the sea turning to blood. Both of these are the judgments, the plagues and the trumpets are both judgments that come up on the earth. Now in the Bible, in the Old Testament, Jeremiah chapter 51, it talks about a nation being represented by a great mountain, even a burning mountain or a destroying mountain which we read about in Isaiah 51:25. So it says this mountain is thrown into the sea. Many Bible scholars see this as judgment that came upon Rome for the role that they played in crucifying Jesus. The first trumpet is judgment that came upon Jerusalem, the second trumpet is judgments that came upon Rome, and they have identified this as the attack of the Vandals. Now if you can get a picture of Europe in your mind, you know where Italy is and where Rome is. The Vandals migrated from the east through what is now France down into Spain. They crossed the Mediterranean and they went to North Africa, at the time, controlled by the Roman Empire. And they established a headquarters in a place Carthage which was on the shore of the Mediterranean. And they organized a very powerful navy of pirate ships that preyed against the Roman shipping. And they went out and they destroyed large portions of the Roman navy, and they pillaged even the city of Rome in 445, I believe it is, that the Vandals actually entered into the city of Rome and vandalized the city, thus the name the vandals goes along with what they did. And so some have seen in the second trumpet, the description of judgment that comes upon Rome for the part that they played in crucifying Jesus. All right, then we go to the third trumpet. You all still with me? Just wait until we get to chapter 9. Okay, verse 10 says, "And the third angel sounded, and a great star fell from heaven burning like a torch and it fell on the third of the rivers and the springs of water." Now here's a big clue. In Bible prophecy, what do stars often represent? Angels. We know that from Revelation 12, we also know that from Revelation chapter 1. Here is an angel, but it has fallen from heaven. Can you give a name to the Angel? What angel fell from heaven? Lucifer. Jesus said, "I saw Satan fall as lightning from heaven." So here is an angel coming or has been kicked out from heaven, he falls to the earth, he's burning like a torch... he almost gives the idea of an asteroid of some kind coming towards the earth. "It fell on the rivers and the springs of water." Notice that the second trumpet sounds, there is a burning mountain that falls in the sea, the third trumpet sounds, and there is this burning star that falls on the rivers and the springs of water. What's the difference between the sea and rivers and springs? Well, of course, rivers and springs, that's fresh water, that gives life, whereas the sea could represent multitudes, and nations, and kindreds and tongues, Revelation 17:15. So here we have this false angel bringing error or lies and diluting the truth of God's Word. So we see falsehood coming into the church. Again, many scholars recognize this as during the dark ages, Satan after the legalization of Christianity in 3:13 and a Constantine bringing into Christiandom, a number of errors and pagan rituals and practices, even to the point where those who are wanting to be faithful to the Word of God, during this time period, suffered persecution from religious leaders in the church. So the truth of God was corrupted and that leads you into, what we know as, the dark ages, a time of persecution that came upon those who wanted to be true to God's Word. Verse 11 gives the name for the star, it's called Wormwood. Wormwood is a bitter herb back in Bible times. It represents a poisoning of the truth of God's Word. Some have also seen in this, another one of those barbarian tribes the Huns under the leadership of Attila the Hun that brought havoc to the Western Rome and the attacks by the Huns. Then we find in verse 12, "The fourth angel sounded, and a third of the sun was struck, and a third of the moon, and a third of the stars, so that a third of them were darkened." Now we have three symbols found here in verse 12, the sun, the moon, and the stars. In Bible prophecy, what does the sun often represent? Represents Jesus. The Bible tells us that, "The sun," S-U-N, "of righteousness shall arise with healing in his wings." So a third of the sun is darkened, and the third of the moon... what does the moon represent in Bible prophecy? In Revelation chapter 12, you have a picture of a woman clothed with the sun, she's clothed in the righteousness of Jesus, she's standing upon the moon. Where does the moon get its light? It gets its light from the sun. It reflects the light of the sun. Where do we get the clearest reflection of Jesus today? In His Word, right? In His Word. What is the church to be founded upon? The Word of God. So when it says a third of the sun was darkened, a third of the moon was dark, and a third of the stars, who are the 12 stars representing that make up the crown of the woman in Revelation chapter 12 that's clothed with the sun and standing upon the moon? Twelve is the number often associated with the church. In the Old Testament, it's the 12 tribes. But in the New Testament, it represents the 12 apostles, the teaching of the apostles. So a number of scholars have seen in this trumpet a description of the dark ages where the truth of who Jesus is and what His ministry is for us in the heavenly sanctuary was darkened from the minds of people. The truth of God's word was darkened, Bibles were chained to the walls of monasteries and the common people couldn't read the Bible. They didn't have the Bible in their own language. It was even against the law to possess even a page of the Bible, and the teachings, the gospel of salvation by faith or by grace through faith delivered by the apostles was hidden from the minds of people. And so they see in this sounding of the trumpet, this fourth trumpet, the dark ages, which parallels will be seen with the seals and also parallels what we studied so far with the churches. So in quick summary of what we've looked at so far, the first sounding of the trumpet represents judgment that came upon Rome in 70 AD. The second trumpet, a burning mountain can represent judgment that came upon Rome by the vandals between 428 AD and 468 AD, the falling of the star represents a compromising of the truth after Christianity was legalized in 313 AD and onwards, as well as the attacks of the Huns, highlighted in 451AD, with their attacks upon Rome. And the sun, moon, and stars darkened represents the Middle Ages or the dark ages where the truth of God's Word of Jesus, the teaching of the apostles was hidden from the minds and the eyes of the people. So that's the first four trumpets. Are you all together? All right, hope you got your seatbelt fastened because now we're going to chapter 9. We're going to be looking at two of the most detailed description of the trumpets in Revelation 9:1 is where we have the sounding of the next trumpet, the fifth and then we have the sixth trumpet sounding in verse 13. So we're not going to be able to read through all of this. We just won't have enough time. But let me hopefully give you enough so that you can study this further on your own about these various trumpets. Starting in verse 1, Revelation 9, beginning verse 1, it says "And the fifth angel sounded, and I saw a star fallen from heaven to the earth." Oh, wait a minute, we've just read about a star falling from heaven. Who does that star represent? Represents Lucifer, represents the devil bringing something to the earth. So here again, we have a star fallen from heaven. And it says, the last part of verse 1, "To him, it was given a key to the bottomless pit." We're going to talk more about the bottomless pit when we get to Revelation chapter 20, but it represents the domain of Satan, it represents emptiness or desolation or just Satan's control, Satan's kingdom, Satan's power. Now the star fallen from heaven, we've already identified as being Satan, the fact that he has a key and he let something loose from the bottomless pit. Some have seen in this that God has allowed Satan to release something upon the earth as the sounding of the trumpet, and we'll find out what that is in just a minute. If you look at verse 2, it says "And he opened the bottomless pit and smoke arose out of the pit like the smoke of a great furnace." Now smoke in Bible prophecy can represent more than one thing. Early in the beginning of chapter 8, smoke was offered with the incense representing the prayers of the saints, but smoke can also represent error or lies, deception. You can read about that in the Old Testament, Isaiah 9:18, talks about wickedness and describes it as smoke. So here, this fallen angel unlocks or releases wickedness or lies upon the earth. They come from the bottomless pit from his kingdom, his domain. And as a result of that, if you read on in verse 2, it says, "The sun and the air were darkened because of the smoke of the pit." The smoke represents errors and lies. What does the sun represent? Jesus. What does the air represent? Sometimes, in Bible prophecy, air is a symbol of the Holy Spirit. Remember on Pentecost and the upper Rome, where the Holy Spirit came upon the disciples in tongues of fire, it says there was sound of a mighty rushing wind. So there was something released by the devil that misrepresented who Jesus is and misrepresented the work of the Holy Spirit. The Holy Spirit is the one that brings conviction. The Holy Spirit brings the new birth experience. The Holy Spirit is the third person of the Godhead. So there was something around this time that was to be released upon the earth that took something away from Christ and His ministry and also clouded the work of the Holy Spirit. Now many Bible scholars, not just recent scholars but those that they back all the way to the time of Martin Luther and the Reformers recognize that in this fifth and sixth trumpet was the rise and the expansion of Islam. The first trumpet is the rise of Islam during the time of Muhammad. And I'd like to read to you just a little bit of the background as to how Islam arose. It says, "Muhammad was born in 570 AD," that's the time period, "in the Arabian city of Mecca. His mother was Aminah, who was a Christian," interesting. "But she died when he was six years old, and he was brought up under the care of his uncle. He later worked as a merchant and a shepherd and was first married at the age of 25. This content with life in Mecca, he retreated to a cave in the surrounding mountains of Medina for reflection. According to Islamic beliefs, it was here at the age of 40, in the month of Ramadan, where he received the first of many visions. Three years after this, Muhammad started proclaiming these revelations that he had received in the cave publicly. Muhammad gained few followers early on and was met with hostility from the inhabitants of Mecca. He finally moved with his few followers to Medina in 622 AD. In Medina, Muhammad united the conflicting tribes, and after eight years of fighting with the Meccan tribes, he conquered Mecca without bloodshed. In 632, Muhammad fell ill and died. When he was born, Arabia was a collection of quarrelsome tribes. When he died, it was a single nation prepared to rapidly expand its borders and strengthen its religion. So this fifth trumpet has been identified as the rise of Islam during the time of Muhammad and shortly after his death, primarily centered around Arabia. So before Muhammad was born, Arabia consisted of different tribes and they fought amongst themselves, there was a whole lot of different beliefs and different deities that have been worshipped, Muhammad was able to pull these various tribes together and bring them all united in this belief, this religion that he had helped establish, and that’s the rise of Islam. Part of the belief, Mohammed and others, was that religion was to be enforced using military strength, and Mohammed did lead armies on many occasions and enforced those that he conquered to become Muslims and to adopt these various beliefs. Are we in the heavenly sanctuary, we're still in the first compartment, it's just talking about the golden altar that is the altar of incense. We haven't yet moved into the Most Holy place. Verse 14 says, "Saying to the sixth angel who had the trumpet release the four angels who are bound on the great river Euphrates." Now just to give you a little background of what we're talking about here, this trumpet, the sixth trumpet has been identified as the expansion of Islam under the Ottoman Empire or the Ottoman Turks, talks about four angels that are bound on the river Euphrates. These four angels have been identified as symbolizing the four Sultans of the Ottoman Empire or of Turkey. That capitals of which was in Baghdad, Damascus, Aleppo, and Iconium, they were converted to Islam and they use their military to expand Islam as far as they could. Of course, as you know, based on history, they were able to conquer turkey, what is present day Turkey to expand all the way down into parts of India, as far over to the east as a number of different West or Eastern European nations that fell under the control of the Turkish Empire, the Ottoman Empire. And that's what's being described here under the sixth angel. Now there is an interesting time period that's given, and you find this in verse 15, and I'm going to read it, it says, "The four angels who had been prepared for an hour..." This is Revelation Chapter 9:15, "They were prepared for an hour, a day, a month and a year, and then they were released to kill a third of mankind." Now again, we have prophetic time. So what does this mean? It says they were to be released. There was a time period for a year. There are 360 days in Hebrew year, so that would literally represent 360 literal years a month. There were 30 days in a Hebrew month. So that would be 30 years a day. That would be one year. And it says an hour that would be about 15 days. As we've already studied. We're talking about a total time period here of 391 years and 15 days. Now the significance of this time prophecy was really brought to view in the early 1800s when these prophecies were being studied. There was a Millerite preacher, was a contemporary of William Miller. Of course, William Miller was talking about time prophecy and studying the book of Daniel. And based upon his study of Revelation chapter 9, he came to the conclusion based on this time period that the Ottoman Empire or the Turkish Empire would eventually surrender to the Christian nations of Western Europe, and he gave a specific time based on this time prophecy. Let me read it to you. It says, "The significance of this time period was brought to view when Josiah Litch, a Millerite preacher predicted that based on the time prophecy, the Turkish Empire would submit to the nations of Western Europe, and he gave the date on August the 11, 1840. Now this was this prediction was made before August 1840. His prediction was perfectly fulfilled. Yes, indeed, on August 11, 1840, the Turkish Empire did surrender. The Ottoman Empire did surrender to the Western nations of Europe, thus validating this time prophecy prediction. So based on a study thus far, we find ourselves up to around the early 1800s, 1840 to be exact, based on this time prophecy. Then the rest of chapter 9, and we don't have time to go into all of that, again is a description of the various armies and the conquest of the Ottoman Empire expanding the influence of Islam all the way up to 1840. Now we have a pause in the sounding of the trumpets and something else is dealt with in Revelation chapter 10. But before we get to Revelation chapter 10 and this is a good part coming along here, let me just remind you of what we've learned so far in our study of the Book of Revelation. You remember when we studied the seals, we look from seal one to seal six which came to the end of chapter 6. Then there was a pause in the sequence of the seals. A question was answered in Revelation chapter 7 "The great day of His wrath is common, who shall be able to stand?" The answer is given, the 144,000, those have the seal of God in their foreheads. And then in chapter 8, verse 1, we go back to finish the seals. And we have this seventh seal that is open. We see a similar thing when it comes to the trumpets. We have trumpet one, two, three, four, five, and six, then there is a pause, additional information is given in Revelation chapter 10, and in the first half of Revelation chapter 11. And then we go back to the sounding of the trumpets, and we find the seventh trumpet sounding in Revelation 11:15. So the time period between the sixth and the seventh trumpet is around 1840 based on the time prophecy that we looked at when the Ottoman Empire would surrender to the nations of Western Europe. So that's roughly the timeframe that we're talking about. Now we go to Revelation chapter 10. Revelation chapter 10 is a very interesting passage not too hard to understand, but let me read verse 1, "I saw still another mighty angel coming down from heaven, clothed with a cloud and a rainbow was on his head. And his face was like the sun, and his feet like pillars of fire." If you look at the description of this heavenly messenger, the word angel means messenger, you find a very similar description given here to the description of Jesus that you find in Revelation chapter 1. It says his face is as the sun, who does the sun represent? Jesus. There is a rainbow upon his head. Verse 2 says, "And he had a little book that was open in his hand, and he set his right foot upon the sea and his left foot upon the land." What does the angel have in his hand? Is it a big book? It's a little book. Is the book sealed or is it unsealed? It's unsealed. Why? Because it's open. All of these are important clues as to the identity of what this book is. Where did he put his one foot? On the sea. Where did he put his other foot? What does the sea represent in Bible prophecy? Revelation 17:15. Represents multitudes, and nations, and kindreds, and tongues. From a prophetic perspective, it represents a densely populated Europe, the land would represent a sparsely populated area. What land was coming around or at least being discovered and been settled around late 1700s, early 1800s? It was the United States of America. And by the way, many of the first settlers that came to the United States came for religious freedom, they were Christians. And so here is a message that has to go to all the world somewhere around 1840, this message is something to do with a little prophetic book that was once sealed, but now it is unsealed. This message is to be preached not only in densely populated Europe but it is also to be preached in sparsely populated America at the time. These are all clues as to what's being described. Now look at verse 3, "And he cried with a loud voice is when a lion roars." By the way, who is the voice of a lion? Jesus is said to be the lion of the tribe of Judah. "As when a lion roars and he cried out and seven thunders uttered their voices. Now when the seven thunders uttered their voices, I was about to write, but I heard a voice from heaven saying to me, 'Seal up the things that the seven thunders uttered and do not write them.'" And then verse five, "The angel that I saw, standing upon the sea and upon the land, raised his hand towards heaven." He's making a solemn oath, and verse six "And swore by him who lives forever and ever who created the heavens and the things that are there in the earth, and the things that are there in the sea, and the things that are there in that there should be time or delay no longer." Notice the phrase, the one who made the heavens and the things that are there in the earth and the things that are there in the sea and the things that are there in, that's parallel to the first angel's message, that says, "Fear God giving glory worship Him that made the heavens and the things that are there in the earth, and the things that are there in the sea, and the things that are there in the fountains of water." So here, we have a parallel to the first angel's message as relates to Revelation chapter 10, and keep that also in the back of your mind. All right, then what does he say? Verse 10, notice this. "But in the days of the sounding of the seventh angel, when he's about to sound, the mystery of God will be finished as He's declared unto His servants the prophets." Now we've already looked at the sixth trumpet, and we looked at the time period that brings you up to 1840. Now this angel with the little book that's open in his hand says, "When the seventh trumpet is about to sound, the mystery of God will be revealed that which was declared to the servants the prophets." Now the little book that's open in the hand of the angel is none other than the little Book of Daniel. Book of Daniel is a little prophetic book. It was sealed, but it is now unsealed. You're reading Daniel chapter 12, where Daniel gets the message. "Seal the book until the time of the end. Many shall run to and fro and knowledge shall be increased." The Book of Daniel had a mysterious time prophecy that was not understood until the sounding of the seventh trumpet. Now you might be wondering what is this seventh trumpet. Let's quickly go to that. Revelation 11:15, Revelation 11:15, it says, "Then the seventh angel sounded, and there were loud voices in heaven, saying, 'The kingdoms of this world had become the kingdoms of our Lord and of His Christ, and He shall reign forever and ever.' And the 24 elders that sat before God on their throne fell on their faces worshiping God, saying this, 'We give you thanks, O Lord God Almighty, the one who is who was and who is to come because you have taken your great power and reigned.'" Notice verse 18, what's happening on the earth, "The nations were angry, your wrath has come, the time of the dead that they should be judged..."
Notice there is a pre-Advent judgment being described, "And that you should reward your servants the prophets and the saints." When are the servants of God and the prophets and the saints to be rewarded? When Jesus comes the second time, so this brings you right up to the second coming of Jesus. Then it says, "And all those who fear your name, small and great, and you should destroy those who destroy the earth." When are the wicked destroyed? At the second coming of Christ. So the sounding of the seventh trumpet brings you right up to the second coming of Jesus. Just a little bit before that, there is a special time of judgment, we call that the pre-Advent judgment. The nations are angry, there is a time of judgment. The plagues eventually are poured out. Notice verse 19, at the sounding of the seventh trumpet, "Then the temple of God was open in heaven." This is when the seventh trumpet sounds, "And the Ark of the Covenant was seen in His temple." Now where is the Ark of the Covenant? In the Holy or the Most Holy Place? It is in the Most Holy place. You remember that under the sounding of the sixth trumpet, we're still in the first compartment. But when the seventh trumpet begins to sound, suddenly we're in the Most Holy place because we can see the Ark of the Covenant. So there is a shift in the ministry of Jesus from the first compartment ministry into the second compartment ministry or the Most Holy place ministry. Now let me finish up chapter 10 before we run out of time. Verse 8, John then hears a book I'll summarize it. He hears a voice speaking to him and the voice tells him to take the little book and eat it up. It's sweet in his mouth, but bitter in his stomach. So John does just that, he takes the book he eats it, it's sweet in his mouth but bitter in his stomach. And then after that experience, verse 11, "And he said unto me, 'You must prophesy again, about before many people, nations, tongues, and kings.'" What does it mean to eat the book? To eat the book means to receive it, to study it, to make it your own. And Jesus said "Thy words were found, and I did eat them." Well, Jeremiah 15:16 says, "Thy words were found, and I did eat them, and they were onto me the joy and the rejoicing of my heart." To eat the book means to study the words of Scripture, to make it your own. Jesus said, "Except you eat my flesh and drink my blood, you have no life in you." And the disciples said, "Lord, this is a hard thing. What does this mean?" Jesus said, "The flesh profits nothing, the words I speak to you, they're spirit, they are power, they are life." So to eat the book means to study the book, to make it your own. It was sweet in the mouth, meaning based upon their study of this little prophetic Old Testament book, the Book of Daniel the book that was once sealed, but now it's unsealed, they came to a certain conclusion that was sweet and wonderful. But when they didn't experience what they thought was to happen, they were bitterly disappointed. Now John here in Revelation chapter 10 plays the part of the early Advent believers, the Millerite believers, who based upon their study, the Book of Daniel, came to Daniel 8:14 that spoke about 2,300 days, then the sanctuary shall be cleansed. They did their math, and they counted, and they looked in Daniel chapter 9, and they realized that this 2,300-year time period end or would end in 1844. They looked at Daniel 8:14, and it said, "The sanctuary shall be cleansed." Well, they thought, the sanctuary was the earth. And the cleansing of the Earth would occur at the second coming of Christ. Christ was to cleanse the earth with fire, they didn't realize that there is a special cleansing work that Jesus does in the heavenly sanctuary in the Most Holy place just before probation closes, nevertheless, based upon their study, and Daniel 8:14 in particular, they reached the conclusion that Jesus was soon to come. While when Jesus didn't come as they had expected, they experienced a very bitter disappointment. And many of those early Advent believers went back to the Bible and they started studying and searching even more to find out where they had gone wrong. Then it was that they began to realize that they had missed a very important truth, the truth of the high priestly ministry of Jesus in the heavenly sanctuary, as well as the special work of cleansing that Jesus wants to do in the hearts and the lives of his people, a work of cleansing that occurs in the heavenly sanctuary in the earth, in the church on the earth, a work of cleansing, a work of judgment that occurs just before probation closes. Then they came to that understanding and then they... Read the last verse, "He said to me, 'You must prophesy again.'" Suddenly they began to realize that their work wasn't finished. Their work had scarcely begun. And from that early beginning, rose up a great worldwide movement of which we're part, whose mission it is to proclaim to every nation, kindred, tongue, and people, the three angels' messages. "Fear God, give Him glory, the hour of His judgment has come." Now there is no other explanation other than the one that I gave you of Revelation chapter 10 that makes sense. If you go to your evangelical friends, and you ask them, "What is Revelation chapter 10 all about, this eating of the book?" they won't have a clue. There is only one prophetic movement that matches the description and the experience that we find in Revelation chapter 10 that is the early Advent movement or the Millerite movement. Revelation chapter 10 is very important for us as Adventists to recognize what our mission is, what is it that God has given us to take to the whole world. And also, the context that we find in Revelation chapter 11, we don't have time to get into the two witnesses, hopefully, you can study a little bit further bio on yourself, but the context of the two witnesses you find in verse 1, it's still in the context of judgment. I was given a read, and I was to measure those that worship in the temple. So we're in this time of judgment that takes place just before Jesus comes. Well, as I look at the clock, I can see that we are out of time for our lesson today. That was an ambitious project to try and cover the trumpets Revelation chapter 10 and even a little bit of 11 all in 50 minutes. But hopefully, I've been able to give you just an overview of these very important truths. I'd like to thank those who joined us today, and I hope that you'll join us again next week as we continue our study in the Book of Revelation. Don't forget to request today's life-changing free resource. Not only can you receive this free gift in the mail, you can download a digital copy straight to your computer or mobile device. To get your digital copy of today's free gift, simply text the keyword on your screen to 40544 or visit the web address shown on your screen. And be sure to select the digital download option on the request page. It's now easier than ever for you to study God's Word with Amazing Facts wherever and whenever you want and, most important, to share it with others. We're here on the beautiful coast of the island of Puerto Rico. And if you were to travel east about 2000 miles, of course, you'd be out in the middle of the ocean. But you'd also be in the middle of a mystical sea called the Sargasso Sea. It gets its name because of this common ground seaweed that can be found floating in vast mass. The area of the Sargasso Sea is about 700 miles wide and 2,000 miles long. Now the seaweed itself is fascinating stuff. It was first observed and called gulfweed by Christopher Columbus. It gets the name Sargassum from the Portuguese. Some people use it as herbal remedies. But out in the middle of the Sargasso Sea, the water is some of the bluest in the world, it's there you can see 200 feet deep in places. It also has a great biodiversity and ecosystem that surrounds the Saragoss Sea. For years, scientists wondered where the American and the Atlantic eels were breeding. They knew the adult eel swam down the rivers out into the Atlantic, but they never could find the place where they reproduced. Finally, they discovered it was out in the middle of the Sargasso Sea. So it's a fascinating place. But if you are an Ancient sailor, you did not want to get stuck there. Being caught in the doldrums was extremely difficult for the ancient sailors. Of course, their boats were driven by wind and sail, and they were caught in the vast mass of the seaweed that would wrap around the rudder, barnacles would begin to grow. It's an area that is notorious for light and baffling winds, and so they make no progress. They get stuck, the men would become extremely dispirited. Sometimes violence and even insanity would break out as people were trapped in the doldrums. Well, friends, perhaps sometimes you feel that you're trapped in the doldrums, you've gone through episodes of depression. You feel like you're going in circles. Life seems stifling. You know, the Bible offers good news. There is a way out. Bible talks about a famous character that was trapped in a cycle of depression. He was low as you could be. Matter of fact, he even had seaweed wrapped around his head, his name was Jonah. But God gave him a way of escape. In Jonah 2:3 through 7, we read, "For you cast me into the depths, into the heart of the seas, and the floods surrounded me. All of Your billows and Your waves passed over me. Then I said, 'I have been cast out of Your sight, yet I will look again towards Your holy temple. The waters surrounded me even to my soul. The deep closed around me. Weeds were wrapped around my head. I went down to the moorings of the mountains, the earth with its bars closed behind me forever, yet you've brought my life up from the pit, O Lord, my God. When my soul fainted within me, I remembered the Lord, and my prayer went up to You, into your holy temple.'" You know, friends, the way that Jonah got out of these discouraging circumstances, he turned to God, and he prayed. And if God could hear Jonah's prayer, just think about it, he was as far away from God as anybody could be. He was in the belly of a sea monster in the bottom of the ocean, in the dark, yet he turned to God, and God heard his prayer. You know, these ancient sailors, when they were trapped on the deck of the ship for weeks, stuck in the doldrums discouraged, sometimes they would have a prayer meeting and pray that God would send a breeze that would set them free and get their boats moving. They turned to God in prayer, and often miracles would happen, and the wind would flutter in the sails and bring them out of their seaweed prison. Friends, maybe you have been stuck in the doldrums, maybe you've been caught in a cycle of depression. If God can do it for Jonah, if He can do it for the ancient sailors, He can do it for you. Turn to the Lord in prayer. Trust His spirit to blow through your soul and to set you free. "The Holy Spirit came down. This is what God wants you to experience. You come to Christ, your sins are washed away, you become a new creature. It's a brand new beginning again and praying and wishing you have a new start." "For I was hungry and you gave Me something to eat, and as much as you do it one of the least of these, my brethren, you did it to Me." "How many of you wish you could get a new start? I'd like to live my life over knowing what I know now. I don't want to start over and just make same mistakes. I want to have my memories so I don't make the same mistakes. But you do get a new beginning, you become a new creature, that feeling of all your sins being washed away because God promised us it. Isn’t that a wonderful concept, friends? "I was thirsty, and you gave Me drink, in as much as you did it to one of the least of these, my brethren, you did it to Me."